Almost anyone who has seen a retina doctor has been told about how and why one should monitor their vision at home using the Amsler Grid. The test consists of a chart of horizontal and vertical lines to detect visual changes. Developed by a Swiss ophthalmologist, Marc Amsler, the tool was designed to help detect visual changes in the retina and especially the macula. Why is it important to detect worsening symptoms quickly and early? 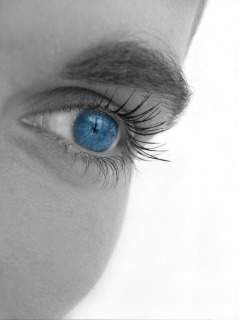 According to Joshua Dunaief, MD, PhD of Sheie Eye Institute, University of Pennsylvania, "If an eye with wet AMD goes untreated for a few months or longer, it can begin to develop retinal scarring. This scarring can lead to irreversible vision loss in parts of the visual field..."
A good eye can compensate for the eye that has more severe vision loss. Which means you may not know that one eye has gotten worse unless you close the good eye. 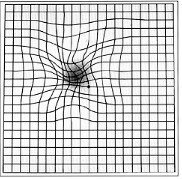 When testing with the Amsler Grid you are testing one eye at a time to monitor vision changes in each eye.